When discovered by LINEAR on 2004 June 16.1 UT this object was moving relatively slowly SSE in Libra at about 1"/min and was placed on the NEO confirmation page for further observations just after 15:00 UT that day. H. Michels confirmed it just before 22:00 UT from Herrenberg Observatory (MPC code 240). Although moving slowly it was apparently accelerating at about 20% per day. The Spanish comet and NEO observer Juan Lacruz (La Cañada Observatory, MPC code J87, discoverer of Minor Planet 2003 SU224) was in the UK that week with his wife, by chance staying just a few miles from Great Shefford and with a good clear sky on the night of 16th June they were invited to visit and help observe. Although there were five objects listed on the NEO Confirmation page that night all but one were either too faint or too far south to be imaged from Great Shefford. The remaining object was only at an altitude of 26° from the horizon and listed as mag +18.7 and moving at just 1.06"/min. A set of 21 exposures were taken but initially could not be found within the uncertainty area given by the Minor Planet Center. When the prediction was refined later that night after the confirmation from Herrenberg the object was located towards the edge of the images (see the animation above) and positions were sent to the Minor Planet Center. After four more observatories in California, Arizona and New Mexico reported positions in the following few hours the object was announced as 2004 MC on Minor Planet Circular MPEC 2004-M07 and this indicated that it was due at perihelion in early July 2004 and had a perihelion distance almost exactly 1 AU from the Sun. Indeed the Minor Planet Center is listing this as an Amor object defined strictly as having a perihelion distance greater than 1.000 AU, but JPL are listing it as an Apollo, with perihelion inside the Earth's orbit (q=1.0083 AU but the Earth being at aphelion at ~1.016 AU from the Sun in July when the orbits of the two bodies are closest to each other). 12 days after discovery on 2004 June 29.5 AU it was to pass less than four Lunar Distances away from the Earth. At that time it would be deep in the Southern skies, not visible from Great Shefford, but would have brightened to mag +14.5 and be moving at about 70"/min. It was last reported on 30th June by John Broughton from Reedy Creek (code 428) in Australia and in the following days faded quickly as it receded from the Earth in the morning sky. 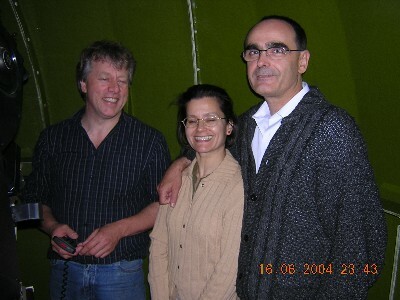 Left to right: Peter Birtwhistle, Covadonga Camblor Lacruz and Juan Lacruz inside the observatory at Great Shefford.